Welcome to our new home on Virginia Key! GA Tier 5 and VIP tickets are available to everyone. GA Tier 5 and VIP tickets are limited to 4 tickets per order. There is an overall limit of 4 tickets per order. Apple Pay or credit cards from Visa, MasterCard, American Express and Discover are the only form of payment accepted. Your shipping and billing address must match in order to complete your purchase. Must be 21 years of age or older in order purchase VIP tickets and access VIP areas. All sales are final and tickets are non-transferable. 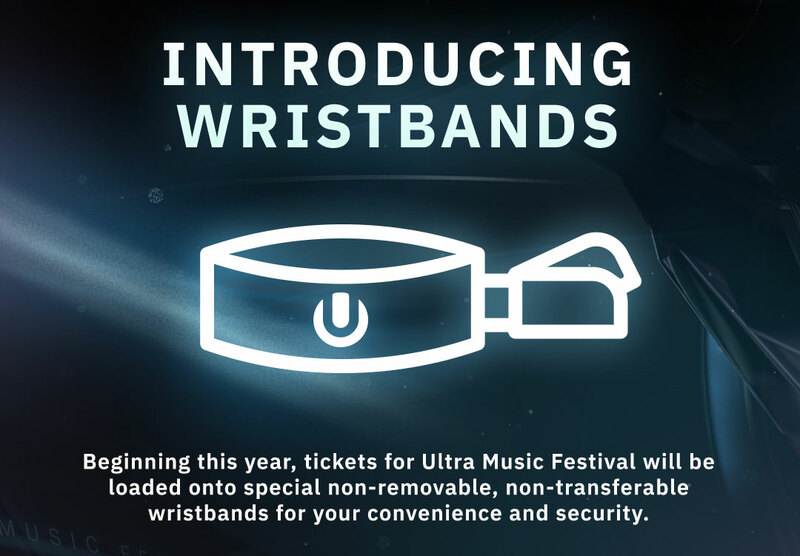 Beginning this year, tickets for Ultra Music Festival will be loaded onto special non-removable, non-transferable wristbands for your convenience and security. Each day, attendees will scan their wristbands at the festival gates for entry. © 2019 Ultra Enterprises Inc.